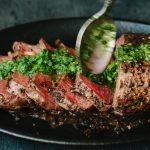 A Palermo Style Italian Steak Recipe or Bistecche alla Palermitana. 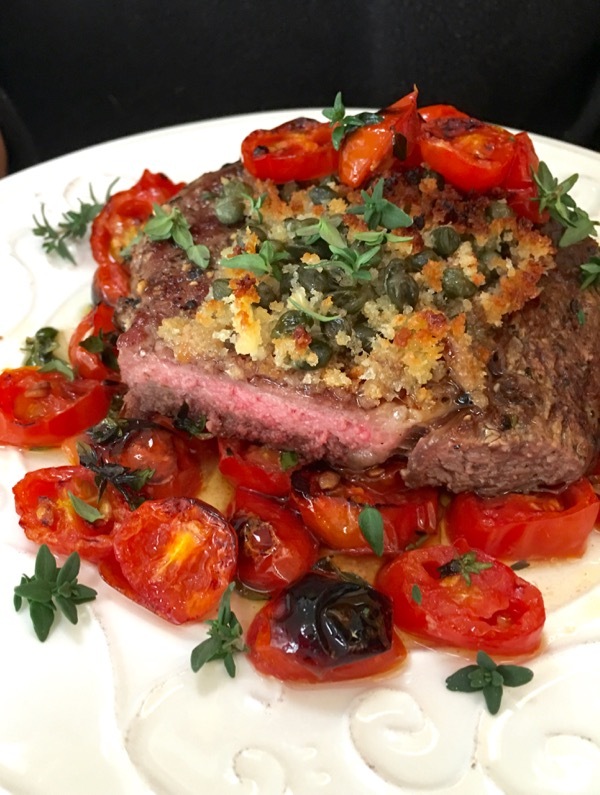 A perfectly grilled rib-eye steak topped with a salty crunchy mixture of garlicky capers over a bed of wine broiled tomatoes. 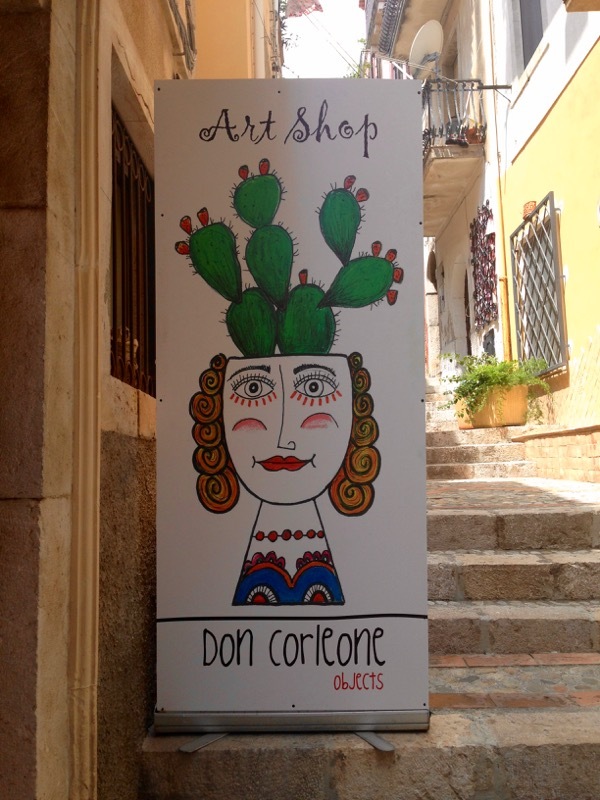 Finally I got the Italian Steak of your dreams! I’m serious, been meaning to post this since we got back from Sicily, because duhh, Palermo-Style Italian Steak is a thing around there ! 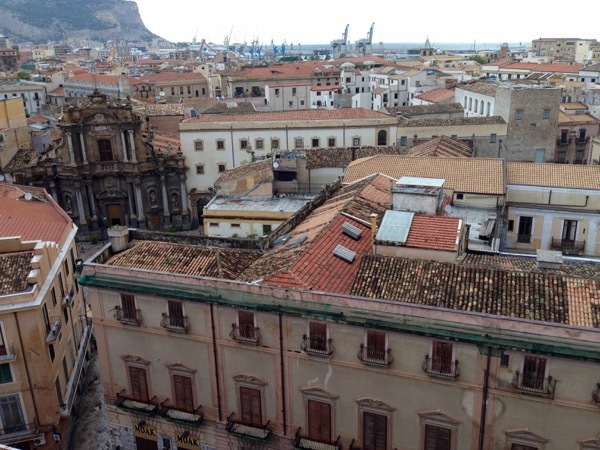 First let me just say: I miss Palermo, the poster child for the perfection of imperfection, we really had a thing for each other. Should I start raving about Teatro Massimo and have a Godfather moment or go on about my steak ..? Okay, I really need to focus! 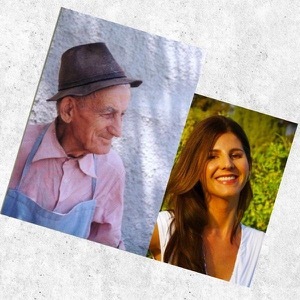 Because otherwise I’ll take you back in time to that summer in Sicily, and traveling across the Island all the way to Taormina, the Sicilian village that served for the village of Corleone in the Godfather series. And then there will be no stopping me, and that would make for too long of a post right before Christmas. I promise you guys: these rib-eye steaks are legit! 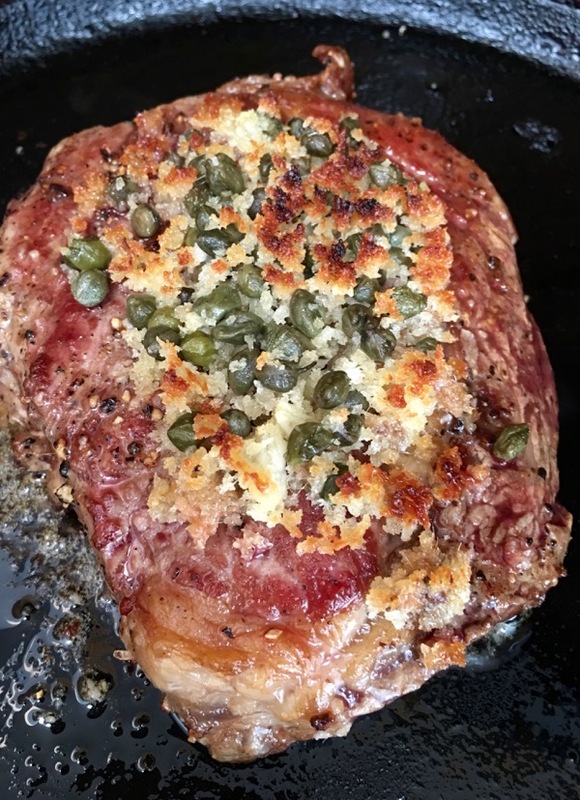 Simply rubbed with olive oil and seasoned well with salt and pepper, then seared to perfection on a cast iron pan/griddle and finished under the broiler with a caper, garlic, anchovy and bread crumb topping. 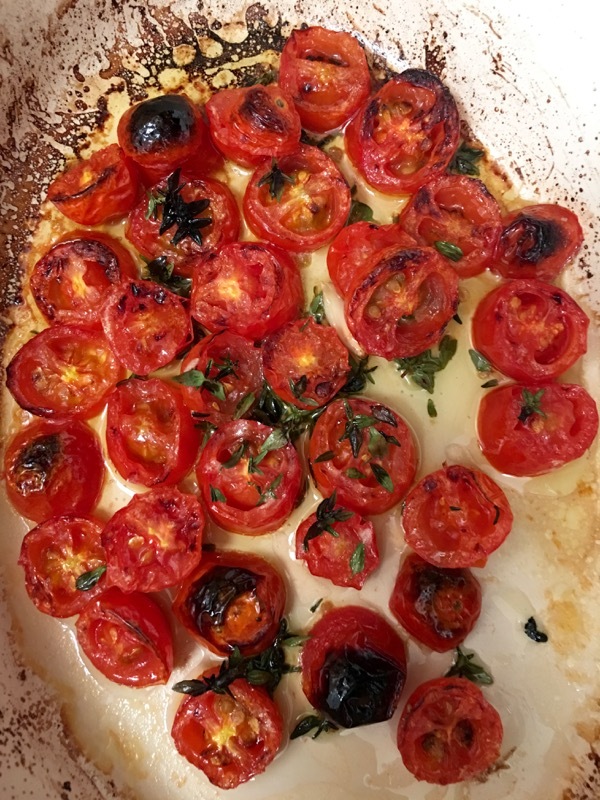 But wait, meanwhile we also broil some sweet juicy cherry or grape tomatoes with a splash of wine or lemon juice and some thyme, until they burst into the perfect sauce. 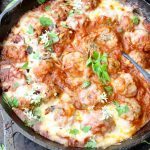 Super tasty and easy to make even for a crowd. Totally festive: red and green served on white plates, ah, this has Christmas written all over it. The moment of truth: an Italian steak, especially Palermo style beats a turkey dinner any day of the week. You are going to look like a rockstar without slaving in the kitchen all morning. You should to be opening presents instead! 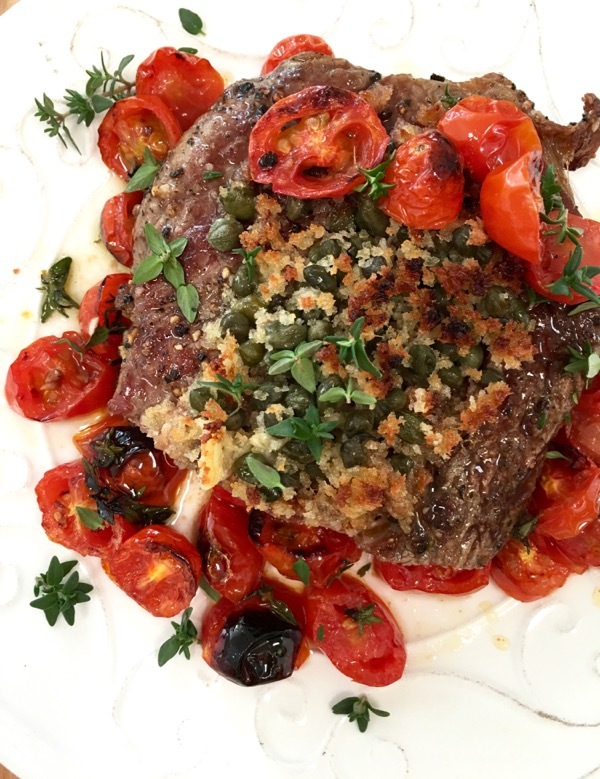 A Palermo Style Italian Steak Recipe: perfectly grilled rib-eye steaks topped with a salty crunchy mixture of garlicky capers over a bed of wine broiled tomatoes. Pat the steaks dry with paper towels and allow them to rest at room temperature for 20 minutes before cooking. Slice the tomatoes and add them to a broiler proof dish. Drizzle with a lug of olive oil and a good pinch of sea salt. Add half of the thyme leaves and a splash of wine. Meanwhile drizzle the steaks with a lug of liv oil and sprinkle generously with the salt and pepper. Massage the oil and spices into the steaks with your hands and set aside. Preheat a cast iron pan or griddle on medium high flame and sear the steaks for 3 minutes on each side for a medium rare steak. in a small bowl combine the capers, garlic, anchovies, bread crumbs with a lug of olive oil. Spoon the mixture on top of the steaks and transfer them to the broiler for a couple of minutes until golden brown on top, making sure not to burn them. 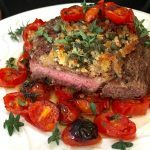 Transfer the steaks on top of the broiled tomatoes and serve garnished with the remaining thyme leaves and a drizzle of extra virgin olive oil. Make sure to allow your steaks to rest at room temperature before cooking, one of the most important steps when cooking steak. This would be a good New Year’s eve meal I think. It’s tasty and it would go well with all the different kinds of alcohol and drinks that people has then. Haha Jeanette, I like how you think 😉 Bring out the red wine ! Happy New Year ! Oh my goodness this looks amazing! Hubby’s grilling steaks for supper right now but I wish I had seen this recipe first. Looks delicious! Next time you do it for sure ! So easy and I bet he’ll love it too. Yum! This sounds amazing. I’ve never tried a dish like this. Sicily on a plate for you 🙂 Must try! Oh my gosh this looks amazing!! My husband loves Italian food and steaks, this would be perfect for him. Looks delish! I think I will try this steak recipe for dinner tomorrow. I’m drooling over those grilled tomatoes nearly as much as the steak itself. What a delicious recipe! Steak is always my husband’s dinner request for his birthday. I need to share this recipe with him. I know he’ll love it. Yum!! That steak looks amazing and those tomatoes are officially the key to my heart. I love this!! oh yes you and me both Sabrina ! Forget the steak, I’m all about the tomatoes ! Oh that looks amazing. Would be a great anniversary dinner, have the hubby make it and just sit back and enjoy. He is a much better cook than I am. Haha, I love how you think Kristi ! 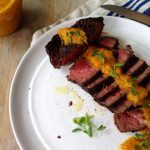 This looks like a delicious way to make up steak, I will certainly have to give this recipe a try! Thanks for sharing it! extra tomatoes for me please! this looks really good! i have never prepared it like this before! I agree, I’m all about the tomatoes myself! Yummy the food looks so good. I’ll have to make it sometime. This is one of my favorite dishes. 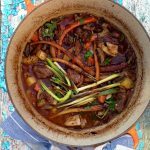 It’s full of flavor and it’s great with some good red wine.